I’m old-school and still keep a paper map in my top box. But getting a sat nav for my motorcycle has changed the way I ride. I’m a lot more likely to go exploring down unknown roads and seeking out scenic routes since I don’t have to worry about getting lost. Knowing where the speed cameras are has also saved me a ticket or two! 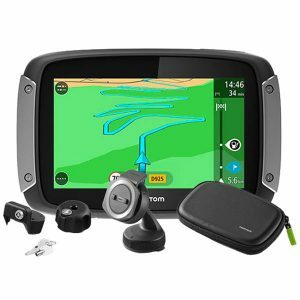 The Garmin Zuma 595 is the best motorcycle GPS on the market today. It has a crystal clear 5″ screen and fast, slick controls. It comes with lots of useful and innovative features such as landmark navigation and smartphone link. For a more wallet friendly option the TomTom 450 is your best bet. Whilst not as slick and fully featured as the Garmin, it does the basics well and comes in a good bit cheaper. Put simply, there are only two brands worth considering: Garmin and TomTom. Sure, you could adapt a car gps for your bike – but you’ll encounter problems like it getting activated by raindrops and not being glove-friendly in the slightest. You could also buy a cheap Chinese unit for your motorcycle. But these cheap sat navs are incredibly unreliable. Plus, you probably won’t be able to update them, which makes them useless after a year or two. It’s better to pay more now than repeatedly buy junk. Navigating on a motorbike as opposed to a car presents certain challenges, requiring a different set of features in your GPS. Hardware: It must come with a high waterproof rating. Ideally it has a rugged design too for when you inevitably drop it. Anti-Glare Screen: The older models for bikes were not very good in the sun. Now both TomTom and Garmin do a good job. Glove Friendly: Some sat navs have settings allowing you to change the sensitivity of the screen so it will work better with summer or winter gloves. 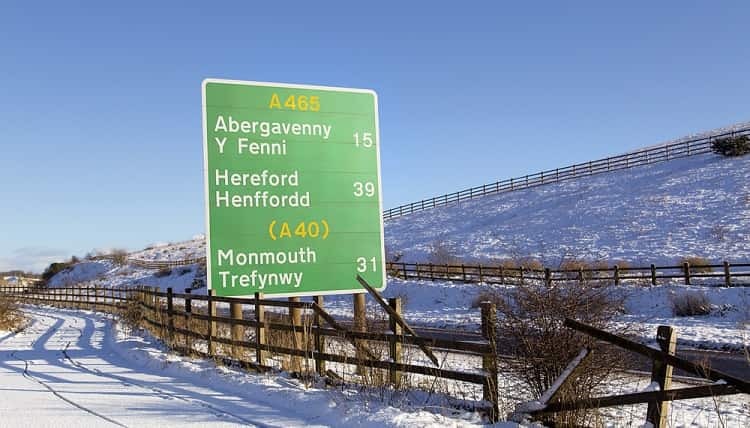 Finds windy routes: A car sat nav will usually look for the fastest route. The best motorcycle ones will have options to help you find the most exhilarating routes. Bluetooth: It’s great to have Bluetooth features so you can use your sat nav for things like hands-free calling and listening to music. Some have speakers. Others rely on a Bluetooth headset. Battery Life: Look for a battery life of at least 4 hours. The larger the screen and better the resolution, the lower the battery life is going to be. Additional Features: You might be able to find cool additional features like fuel consumption planning, tyre pressure monitoring, 3D terrain, helmet law notifications and more. 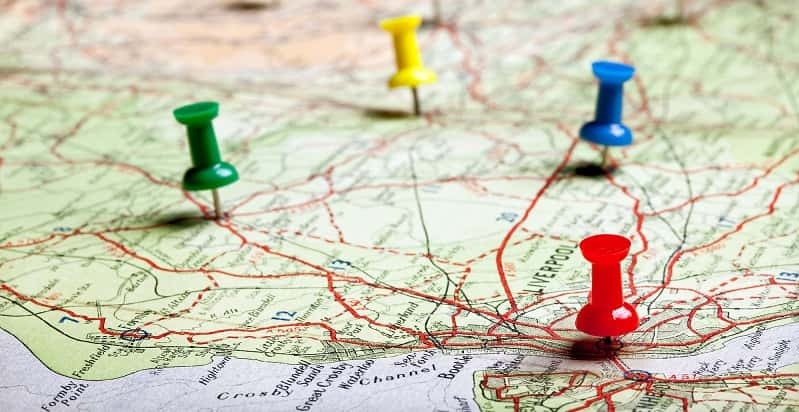 Just like with car sat navs, you will need to get maps uploaded. Some devices come with lifetime free map updates. Just pay attention to which maps are included. If you only buy Western Europe maps, for example, but then want to take a trip to Tunisia, you might have to pay nearly as much for the Tunisia map as you did for the GPS. Since Garmin and TomTom are the only options worth considering for a motorcycle, I thought I’d do this review a bit differently. Here’s a breakdown of how the brands compare, plus their top models. 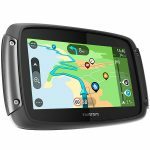 The Garmin Zumo and TomTom Rider lines are designed for motorcycles. So, yes, they are very rugged. Both have a waterproof rating of IPX7 and will hold up fine in storms. Note that only some of the TomTom Rider sat navs include lockable mounts. None of the Garmin Zumo ones have them included. Not that I’d recommend leaving your sat nav on your bike (even the best lockable mounts can be easily stolen). But a lockable mount is nice if you need to make a quick run inside and don’t want to remove it. Both Garmin and TomTom units come preloaded with maps. They both also offer a lifetime of free map updates. I’d recommend updating your maps at least once yearly. As far as the maps go, Garmin maps seem to be much more detailed and have more points of interest (like petrol stations). This is pretty handy in unfamiliar territory. However, TomTom has many more countries. If you want to travel outside of the UK and EU, then TomTom is probably better. These brands specifically target motorcycle riders and know what they want. You get great route planning tools to help you find the windiest, hilliest, most adventurous roads for your ride. Garmin has “Adventurous Routing” which lets you set how many bends and hills you want. It also lets you avoid motorways. The only annoying thing is that this feature is deep in the menu. The TomTom program does a lot better than Garmin at finding windy roads. It will even find really remote back roads. Both products also provide the usual route planning tools, such as warning radars, points of interest, speed limit indicators, sharp curve warnings, the ability to record routes, and other alerts. At first glance, the Garmin screen might seem better than the TomTom. Some Garmin models have a 5” screen in high-resolution. TomTom’s are only 4.3” and 480×272 pixels. However, the TomTom screen is a lot easier to use and read. A lot of it has to do with the software, which makes scrolling through the options a lot easier. TomTom also lets you set the sensitivity of the screen – great for when you are switching from summer to winter gloves. Pretty much everyone I’ve talked to agrees that TomTom software is easier to use. It scrolls better and is more intuitive to use, especially while on the road. TomTom also has voice command, something that Garmin is surprisingly lacking. Another nice thing about TomTom is that you can get traffic and speed camera alerts at no extra cost. Only some Garmin Zumo sat navs offer this. Garmin somewhat makes up for these deficiencies by offering some interesting extra features. There is the “photoReal Junction View” of approaching junctions. A tool lets you estimate fuel consumption and even plot your last fuelling. You can use an accessory (sold separately) to check tyre pressure too – something that I haven’t seen on any other motorcycle sat nav. There’s some safety issues with listening to music while riding, but a lot of people do it. So, a feature worth mentioning is that the TomTom Rider does not let you play MP3 files. The Garmin Zumo 395 and 595 models do allow this. With the Zumo 595 you can also connect to music streaming services like Spotify to play music. Of course you can still use Bluetooth to play music from your phone with the TomTom Riders (which is what most people probably do). However, if you want to listen to MP3s too, then Garmin is your only choice. Even though TomTom is a lot easier to use, Garmin still has the better maps. I also love that their maps give directions based on landmarks instead of the standard “turn after X meters.” This alone makes them worth paying the extra money for. Garmin is the pricier of the two brands though. If you are on a tight budget, I’d recommend a TomTom Rider. When comparing the various TomTom Rider models, they seem almost identical. All of them have the same screen size, battery life, and major features. The only obvious differences between the actual devices are with internal memory. The core difference between TomTom Rider models is the number of maps offered. This is important because buying maps afterwards costs nearly as much as the device itself. The TomTom 450 also offers offline maps which the 42 and 400 don’t have. Once you actually start using the products though, you can see a bigger difference. The Rider 450 is a lot faster than the other models. Its touchscreen also seems to respond better, especially when using gloves. Since it comes with lifetime world maps including offline maps, it is worth paying the slightly higher cost. Zumo is Garmin’s series of products. The most recent releases (at time of writing) are the Zumo 345, 395, and 595. Unlike TomTom Rider sat navs which are very similar, there are some major differences between the Zumo sat navs. Of the three products, the Zumo 595 is by far the best. It has a 5” screen with a hi-res display. This makes it very easy to see the maps, even with a glare on it. The 5” screen does compromise the battery life though, so be prepared to charge it more frequently. Another main benefit of the Zumo 595 is that it has a Smartphone Link app. With this app, you can do things like get live traffic reports, weather updates and stream music from Spotify. I love the LiveTrack feature which lets you see where your friends are. Note that not all of these features are free – you have to buy a lifetime subscription. The Zumo 345 can’t do any of this, and the Zumo 395 can only do some of it. Of course, the Zumo 595 is a lot pricier than these models. So you really have to decide how much those features are worth for you. If you are trying to save money, I would choose the TomTom Rider 450. 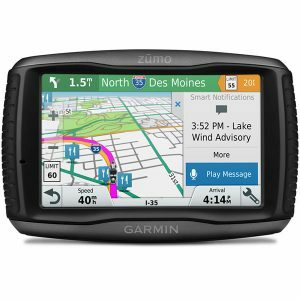 If you are willing to pay more for extra features and a faster interface, then the Garmin Zumo 595 is the way to go.